This is a guest submission from Rakesh Kumar. First let me explain what elastic thread is. It is a kind of elastic which is mounted with thread. This thread is stretchable. Mainly used for shirring, smocking in garment component. 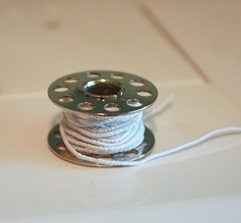 Thread mounting can be done clock wise or anti-clock wise. Anti-clock wise wrapping is helpful to provide locking strength to the stitch. Elastic threads are available in different count. Elastic threads are thicker than normal threads. The elastic thread can be used as bobbin elastic or looper elastic or needle elastic. Material is almost same in all cases. When elastic is fed from bobbin, it is known as bobbin elastic. There are two kinds of bobbin elastic thread. First one is knitted elastic thread and other one woven elastic thread. Normally woven elastic thread in woven garment and knitted elastic thread in knitted garments. In case of bobbin elastic, stitch formation is being done with normal thread in needle and elastic thread in bobbin. This is used to provide gather look (shirring) in the garment or to meet style specification. Elastic thread is visible from the bottom and normal thread on the top of the seam. Many assume that in bobbin elastic stitch formation is being done on needle/looper thread while elastic is fed through spreader is called bobbin elastic. But it is not. This stitch is being done on lock stitch machine only. Elastic thread can be winded (coiled) in bobbin manually or through bobbin winder. This stitch is helpful to provide better strength to seam due to lock stitch features. While winding bobbin thread should not be stretched. Additional information: Sourcing lead time of white elastic thread is 3-6 days while for dyed 5-12 days depending on the supplier (in India). Rakesh Kumar has nine years of work experience in garment manufacturing field. He is currently working as Manager, Re-engineering Team of Management Audit at Shahi Export Pvt. Ltd. Earlier he worked as industrial engineer in garment export house. What is elastic thread, bobbin elastic and use of bobbin elastic thread.